The guys over at BuzzFeed posted this awesome list of “Elf” Quotes That Never Get Old … and we think tonight’s the night to dig out the DVD !! The 2003 film stars Will Ferrell, Zooey Deschanel, James Caan (plus Game of Thrones’ Peter Dinklage) and grossed over $175 million worldwide. You can check out more over at BuzzFeed. Posted in Hollyshop Blog. and tagged as Christmas Card, Elf Movie Quotes, Elf Quotes, Game of Thrones' Peter Dinklage, Good News, Santa, Son of a Nutcracker, The Best Elf Quotes, Will Ferrell, Zooey Deschanel. With DC Comics building their own Cinematic Universe, it has been announced that Game of Thrones‘ Michelle MacLaren will direct the forthcoming big screen adaptation of Wonder Woman, ending months of speculation. Starring Gal Gadot, the eagerly awaited adaptation of the iconic supperhero will be developed by MacLaren alongside Producers Charles Roven, Zack Snyder, Debbie Snyder and Richard Suckle. MacLaren’s previous works include the aforementioned Game of Thrones, Breaking Bad and The X-Files, and it is believed that the veteran director had taken several meetings with the studio earlier this month. Little is known about the first solo outing for Diana aka Wonder Woman, but the film is expected in cinemas on June 23 2017, following Gadot’s debut as the character in Batman V Superman: Dawn of Justice on March 23 2016. Posted in Hollyshop Blog. and tagged as Director, Gal Gadot, game of thrones, Michelle Maclaren, Wonder Woman. Warner Bros. Home Entertainment has released the trailer for their upcoming follow-up to the TV special “Batman Be-Leaguered” with LEGO DC Comics Super Heroes: Justice League vs. Bizarro League. Though the film is set to feature the Justice League going up against their Bizarro counterparts, it will also feature major big bad Darkseid in his LEGO debut. Posted in Hollyshop Blog. and tagged as DC Comics, Justice League vs. Bizarro League, LEGO, trailer. With Ant-Man (which was only briefly mentioned) wrapping up Phase Two in mid-2015, the focus at Tuesday’s media/fan event was firmly on the third Phase, which kicks off in 2016 with the third Captain America film. Initially teased on the theatre’s big screen with the subtitle Serpent Society, it was quickly revealed to be Civil War, with Robert Downey Jr. and Chris Evans appearing on stage to adopt boxing poses and confirm that the latest Cap outing will indeed pit Steve Rogers against Tony Stark in a moral conflict that spills over into a real clash in the wake of the events ofAvengers: Age Of Ultron. The film’s logo carries a May 6, 2016 date, though it may hit the UK earlier. Following that, Doctor Strange will make his full debut in the Marvel universe. While there is still no confirmed casting for the lead – Benedict Cumberbatch is the current rumoured front runner, though Marvel president Kevin Feige wouldn’t be drawn on the matter – Sinister director Scott Derrickson is working away ready for November 4, 2016 release date, a little later than originally thought. 2017 kicks off the era of three Marvel movies a year, as Phase Three really lives up to its name. First out of the gate will be Guardians Of The Galaxy 2, which writer/director James Gunn announced via video message (he’s in Tokyo at the moment) would arrive a month earlier than anticipated, pencilled in for a May 5, 2017 slot. That’s to make more room for the next Thor film, subtitled Ragnarok, which, according to Feige, sees the return of both Chris Hemsworth’s hero and Tom Hiddleston’s Loki. Because, let’s face it, Asgard just isn’t as fun without the trickster. Later in 2017, Black Panther finally makes his debut, and Team Marvel had freshly-cast leading man Chadwick Boseman on hand to share the stage with Downey Jr. and Evans. You can read more about the Panther’s solo film here. She’ll be joined in November of that year by The Inhumans, a storyline that has been rumoured for a while and got more credibility a couple of months ago. There’s more about them here. And, finally, the Avengers will be back (with whatever line-up the team has following the fallout ofAge Of Ultron and Phase Three’s various cataclysms) for a two-part tale called Avengers: Infinity War, due in May 2018 and May 2019. As the title suggests, it’s what the Marvel Cinematic Universe has been building to, with Infinity Stones such as the Tesseract (from the first Captain Americaand Avengers films), the Aether (Thor: The Dark World) and the Orb (Guardians) among the items Thanos (voiced by Josh Brolin in Guardians) is looking to collect to use with the Infinity Gauntlet, which will make him so powerful it’ll need the Avengers and two films to deal with. So that’s it for the Marvel Cinematic Universe for now. What do you make of the announcements? Are you excited? Do you wish other characters had gotten their due? Let us know below and on Twitter. Posted in Hollyshop Blog. and tagged as ant man, Black Panther, Captain America, Doctor Strange, Guardians Of The Galaxy 2, Thor. It’s no Halloween trick: There’s more witchcraft and wizardry in store for “Harry Potter” fans, who can expect a new tale from author J.K. Rowling on Oct. 31. In an announcement posted to Pottermore.com, Rowling reveals that she has penned a new 1,700-word story that will offer “revealing first-person” thoughts about former Hogwarts professor Dolores Umbridge. Umbridge is a fitting character for a Halloween story, as fans will remember her as the pink-clad villainous instructor who tortured students during her time as headmistress. (Imelda Staunton played her in the fifth and seventh films in the series of on-screen adaptations of the books). Rowling released two other wizarding stories earlier this year: One following a 33-year-old Harry Potter at the Quidditch World Cup and another about singing sorceress Celestina Warbeck. The author is also writing a screenplay for the “Potter” spinoff, “Fantastic Beasts and Where to Find Them,” which is set for a November 2016 release. Posted in Hollyshop Blog. and tagged as Fantastic Beasts and Where to Find Them, harry potter, jk rowling, Pottermore, spinoff. The CW Renews ‘The Flash’ After just 2 Episodes! The Flash airs in the UK on Sky 1 at 8pm on Tuesday (October 28th) so we thought we would share some of the buzz surrounding the new TV Series. Based on the comic book character of the same name, The Flash tells the story of Barry Allen – a man struck by lightning and who wakes up from a coma to discover his body transformed and that he is the ‘fastest man alive’. 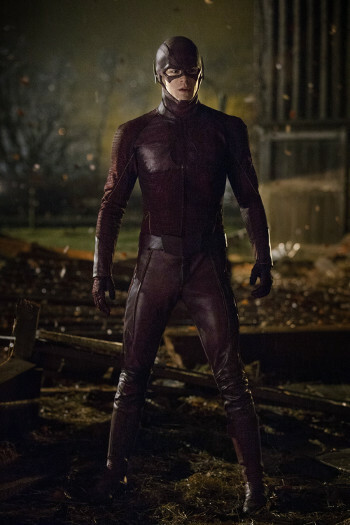 Grant Gustin dons the famous red outfit, reprising his role as Barry Allen having unveiled the character on the hugely popular ‘Arrow’ – another comic to TV show success story based on the DC character Green Arrow. Keen Flash fans will find that some of these names ring a bell from the DC Comics world, although Arrow hasn’t stuck rigidly to the canon, so it was always likely that The Flash wouldn’t either. Whether you know the names or not, each story thread fairly thrums with possibilities, keeping the pilot zipping along nicely. Only the utter blindness of Iris to Barry’s love and her predictable fall into the arms of Thawne are a bit tired. But this is the usual superhero formula – to have the girl of his dreams hanging around but initially unattainable – but it can get boring and if you’re going to update things, isn’t this the sort of thing that could easily go? Josh Wilding, a Cardiff-based writer for film website HeyYouGuys.com and ComicBookMovie.com, adds that there is a huge appetite for comics-turned-TV-series and The Flash is doing particularly well. Super hero fans are in for another televisual treat later this month when the UK premiere of another DC legend hits the small screen. Posted in Hollyshop Blog. and tagged as episodes, pilot, ratings, review, the flash, trailer, when does flash air in uk. The shape of True Detective’s second season is beginning to come into focus. Controversial choices, Colin Farrell and Vince Vaughn are officially on board to star in the show’s new episodes and from the sounds of it, Rachel McAdams is close to joining them. According to Variety, McAdams, who has been rumoured for a role almost as long as Farrell, Vaughn and the still-unconfirmed-but-likely-close Taylor Kitsch, has been offered the third lead in the show, but HBO has yet to make an official announcement. That should be coming shortly assuming the deal is made. With Nic Pizzolatto once again writing and overseeing the series and Justin Lin hired to direct the first two episodes, the new season is set in California locales and sees Farrell as Velcoro, a compromised detective whose allegiances are torn between his masters in a corrupt police department and the mobster who owns him. Vaughn will play Frank Semyon, a career criminal in danger of losing his empire when his move into legitimate enterprise is upended by the murder of a business partner. The season will run as eight hour-long episodes and is scheduled to start shooting this autumn. McAdams and Kitsch – if they both sign on – are set to be police officers working alongside Farrell. The actress is back on our screens currently in A Most Wanted Man and is shooting boxing drama Southpaw. Posted in Hollyshop Blog. and tagged as cast, Rachel McAdams, True Detective. There has been talk for months now about Screen Gems developing a new Underworld film, one that will offer a reboot and pass the torch to a new cast. According to The Hollywood Reporter, Priest writer Cory Goodman has landed the job of scripting the new film, which was at one point called Underworld: Next Generation. It might seem odd to reboot a series that only began in 2003 and has run successfully for four films, with the last, 2009’s Underworld Awakening, earning the most of the franchise so far. But a new cast offers a chance for fresh stories, assuming they’re going in a different direction and not hiring someone to simply play a new Selene, the vampire warrior played by Kate Beckinsale in all the movies so far. Awakening introduced her daughter, Eve, so that’s one avenue that could be explored. Nothing has been confirmed about the plot, though we’d guess that the conflict between the fang club and their hairy enemies the Lycans (werewolves) will feature in some fashion. And depending on whether the idea is to re-set the clock or tell a new story in the same universe, we may be in a world where humanity is more aware of the ancient conflict. Posted in Hollyshop Blog. and tagged as Cory Goodman, Kate Beckinsale, New Cast, Underworld Reboot. Andy Serkis’ project, Jungle Book: Origins for Warner Bros has revealed that Benedict Cumberbatch has agreed to lend his distinctive voice box to Shere Khan, the man-eating tiger who is the villain of the classic tale of a boy named Mowgli who is raised by jungle animals. Serkis is developing the movie to incorporate a blend of live action and performance capture, looking to make his directorial debut based on Callie Kloves’ script. Expect announcements soon about characters including Mowgli, the human raised by wolves and other animals who is Khan’s sworn enemy, wise panther Bagheera and friendly Baloo the bear. The film is expected to hit cinemas October 21, 2016. Posted in Hollyshop Blog. and tagged as Andy Serkis, Benedict Cumberbatch, Jungle Book Origins, Shere Khan, Voice. We are delighted to announce a UK release date (July 22, 2016) for a new feature film adaptation of Roald Dahl’s universally loved classic THE BFG (the Big Friendly Giant), directed by Steven Spielberg. First published in 1982, The BFG, one of Roald Dahl’s most iconic books, with memorable illustrations by Quentin Blake, was recently voted amongst the top 10 favourite children’s books of the past 150 years. 2016 will also mark the centenary of Roald Dahl’s birth. Legendary film director Steven Spielberg will direct the new adaptation with Melissa Mathison, who last worked with Spielberg on ET, writing the script. Frank Marshall and Spielberg will produce the film and Kathleen Kennedy, John Madden and Michael Siegel are on board as executive producers. The BFG will be a DreamWorks Studios and Amblin Entertainment production. The BFG tells the tale of a young girl, the Queen of England and a benevolent giant known as the BFG, who set out on an adventure to capture the evil, man-eating giants who have been invading the human world. Roald Dahl has sold 200million books worldwide, 37million of these in the UK. The film adaptations of his books have grossed over £65million at the UK box office. Posted in Hollyshop Blog. and tagged as 2016, BFG The Movie, July 22, Roald Dahl, steven spielberg. Following the success of Disney’s live action Maleficent and Alice in Wonderland, it has been announced that the House of Mouse will give the live action treatment to beloved classic Dumbo. The Hollywood Reporter report that the film will be written by Transformers franchise scribe Ehren Kruger with Tron: Legacy and Oblivion’s Justin Springer producing alongside Kruger. The adaptation of the 1941 classic that follows the exploits of a circus Elephant with large ears, giving him the ability to fly joins the live action slate of beloved classics that includes Cinderella, The Jungle Book and Beauty and the Beast that are currently in the works at Disney. Dumbo is one of Disney’s shortest feature films with a runtime of 64 minutes and won an Oscar for best scoring of a musical picture and was nominated for best original song for “Baby Mine”. Posted in Hollyshop Blog. and tagged as Baby Mine, disney, Dumbo, Live Action, remake. Middle Eastern artist Saint Hoax, who previously depicted Disney princesses as victims of sexual abuse, is back with another thought-provoking awareness campaign. Called ‘Happy Never After’, her shocking new campaign this time depicts the princesses as victims of domestic violence. Featuring Cinderella, Ariel and Jasmine, they were drawn with black eyes and bruised faces. According to the artist, the aim of the campaign is to “encourage victims to report their cases in order for the authorities to prevent it from happening again”. Posted in Hollyshop Blog. and tagged as Awareness, Beaten, Happy Never After, princesses, Saint Hoax, treat you like a princess, Victims Of Domestic Abuse.